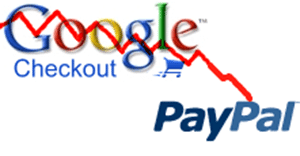 I just received an unexpected email from my favourite payment processor, Google Checkout. It’s a rather interesting announcement that in around six weeks their fees are increasing. They’re increasing quite a bit too; users who charge less than £1,500 per month are going to find the fees more than double. Users who charge £15,000 to £54999.99 each month but whose customers originate from a different country (so that’s a UK company selling to a US individual or organisation) are going to see a double increase in fees. Starting a business in the middle of a recession. Am I crazy? You’ve probably noticed that across the world we’re all experiencing a financial crisis, a global financial meltdown that has driven the UK into a strong recession. You might be one of the people who have been directly affected by this or you might be working or investing in industries that are relatively untouched. In any case, I would like to tell you a little about a nice little start-up that I’m involved with and why I feel that the current shaky economic conditions might not be as bad for starting a new enterprise as we’ve been led to think. At least, I hope so. Continue readingStarting a business in the middle of a recession. Am I crazy? Are you using a pirated copy of Windows XP? Continue readingAre you using a pirated copy of Windows XP? June is over, but I still have 1 precious day left of my 30 day sprint to go from design to release for a new software product. In short, the product won’t be releasing commercially at the end of the challenge. I’ve got too much testing to do and have all the documentation to write. This weekend I’ve been learning some basic web design skills. That is, after writing my rather preachy blog article on financial success here. I’ve taken myself on a basic CSS course, courtesy of w3schools.com and I’ve started putting together the basic outline of my very first ASP.NET website. Today I have been mostly working on the design of www.software-monitor.com, the new desktop software monitoring service for software developers and publishers.